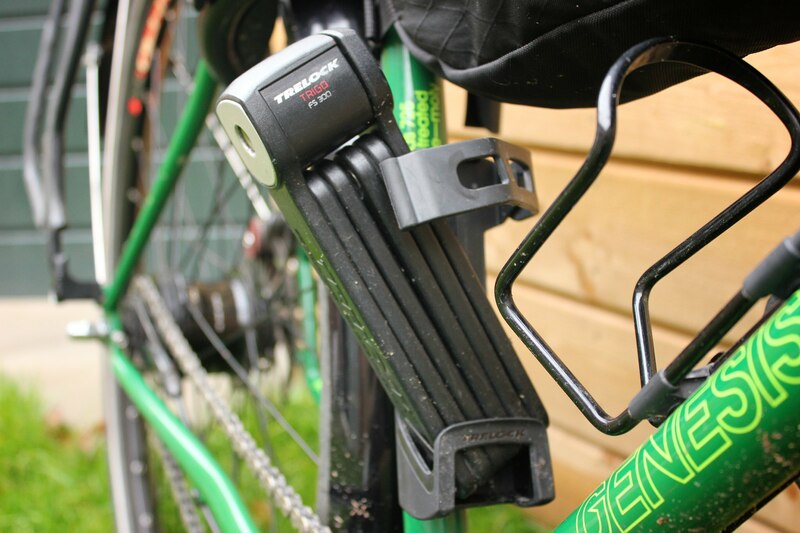 When I got the Trelock FS 300 Trigo folding lock in 2013 it was obvious that it only barely fit on my bicycle. The lock holder requires you to pull the lock all the way up. My girlfriend's bicycle had a frame size one size smaller and there I had to mount it on the down tube in order for it to fit. After acquiring some frame bags the problem became worse. Taking out the folding lock was such a hassle that we would often forgo it. The day a thief tried to steal our bicycles we reluctantly used one, which happened to save our bicycles. After the other lock was broken the folding lock became my primary lock for a while. The hassle of the holder made me keep it in my frame bag, where it would take space and rattle around. I even considered taking a hacksaw and cutting out a side of the holder to make it easier to use. I never got around to it. When looking for a new lock I came across the Trelock X-Move. A new holder that fits the FS 200 TWO.GO, FS 300 TRIGO, and the FS 460 COPS folding locks. It even comes in six different colors. It is heavily promoted on their website, but when it came to buying it, there were very few places that sold it, even if they were selling other Trelock products. I emailed Trelock and asked them to send me one to review it on my website, but my email was ignored. When ordering some other bicycle parts I asked the store if they could sell me the Trelock X-Move. It was possible to have it custom ordered, it took a week, cost about 10 euros, only in black and no return possible. 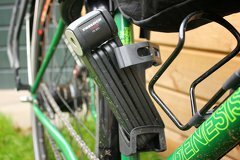 The lock comes with some plastic straps that allow you to install it on any tube. I installed the holder on the eyelets for a bottle cage, which is even easier, two M5 bolts did the job. You can choose if you want the closing strap to open form the left or right side. I moved the old holder to another bicycle with a larger frame. The rubber strap secures the lock quite well, inside the original holder the lock would rattle a bit, that is no longer the case. Taking the lock out is significantly easier. The first few times I was still dreading using the lock, but every time was pleasantly surprised how fast and easy I could now take out the lock and put it back in. The X-Move holder works a lot better than the original. It should be the standard holder for these type of locks. Unfortunately Trelock does not have their customer service and supply chain sorted, buying the lock is such a hassle that I can't imagine many people going out of their way to buy one. The lock mounted on the seat tube just under the frame bag. 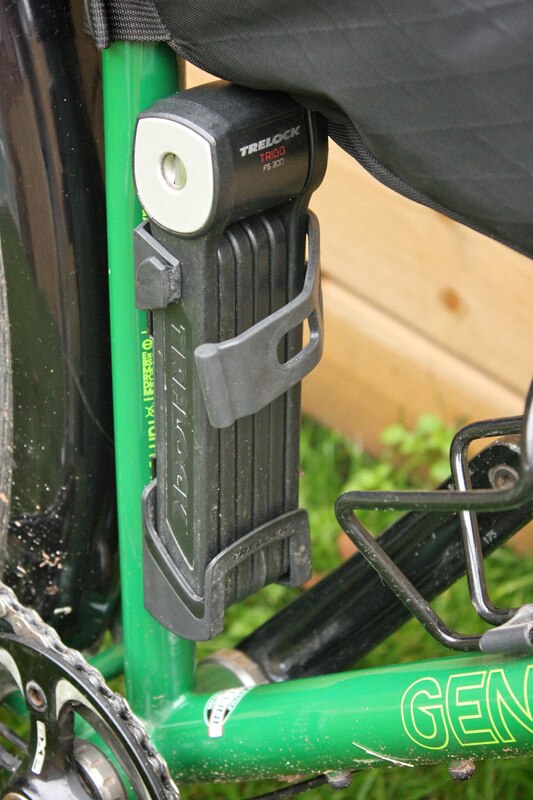 The rubber strap can be attached to both sides, allowing the lock to be taken out from the side. 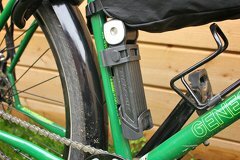 Without closing the strap the lock is held in place, allowing it to be put in with one hand. 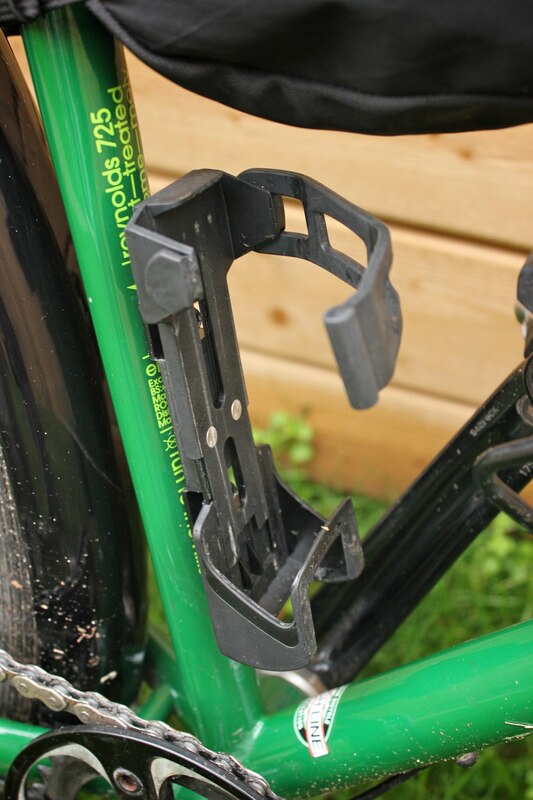 Close up of the lock holder without lock.